Home » Behind the Scenes » Blog » Come Meet Sheldon in Lands of Change! 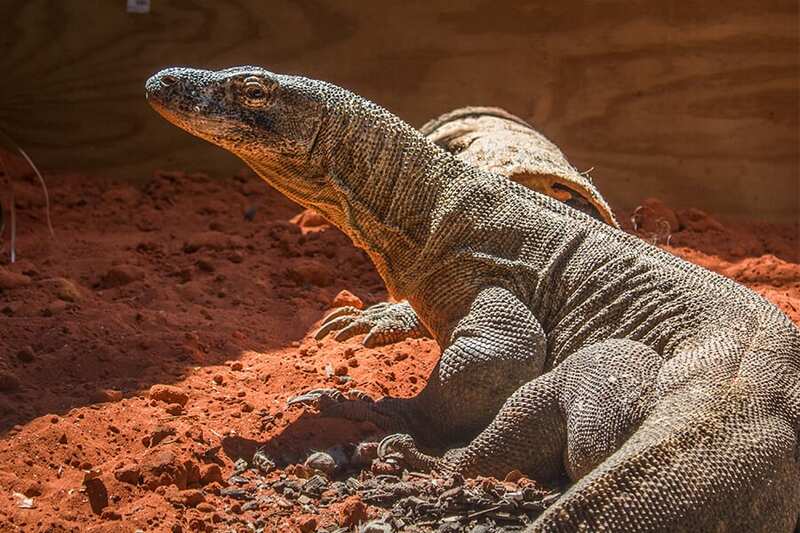 Talk about a big lizard—Komodo dragons can weigh up to 200 pounds! He may not breathe fire, but we still think Sheldon is a pretty cool dragon! You can now see this 11-year-old Komodo dragon in Lands of Change: Australia and Beyond. Our staff have been working hard to make sure that Sheldon’s habitat is suitable for a dragon of his size. The reptile, who arrived earlier this year from St. Augustine Alligator Farm Zoological Park, measures over seven feet in length and weighs more than 100 pounds. Sheldon has joined female Sha-Sha as part of a Species Survival Plan, but they will not cohabitate until she reaches sexual maturity in the coming years. Elsa, the Zoo’s other female dragon, has moved to a behind-the-scenes area. Komodo dragons are considered vulnerable to extinction. The world’s largest lizards face significant threats such as habitat loss, human hunting and depletion of food sources.